What is a Commodore Computer? There are many individuals who have probably never heard of the Commodore home computers and are unaware of their incredible legacy and the tremendous impact which they have had upon the evolution of computers. Some of the younger generation who are too young to remember the 1980's may still not have seen or heard much-- if anything-- about Commodore computers and likely have very little sense of their significance. Likewise, many of the middle aged and older generation who did not develop an interest in computers until recently may be equally uninformed. However, most individuals who were involved in the home computer and electronics fields during the 1980's are probably somewhat familiar or quite familiar with the Commodore products and their history. Commodore's most popular model, the Commodore 64, was the Model T Ford of the home computer movement. As you may recall the Model T Ford was the first automobile that the average person on an average income was able to afford or justify buying because of its low price, extensive consumer-oriented marketing, and usability. The Commodore 64 is an 8-bit computer that uses Commodore DOS instead of MS Dos or Windows. In fact, for the most part it cannot run IBM or Macintosh computer programs. The Commodore 64 has BASIC 2.0 and 64k of memory although when you turn the computer on it indicates only 38,911 bytes available because nearly half of its memory is used for internal functions. The Commodore 64 was actually part of the evolution of computers marketed by CBM (Commodore Business Machines) which had previously proliferated the CBM and PET business computers into business and academic settings and who had then subsequently developed the VIC-20 computer which was the predecessor to the Commodore 64. The Vic-20 (named after its revolutionary Video Interface Chip) had captured the imagination of many enthusiasts around 1981 because of its very user-friendly BASIC language, nice color graphics, programmable sound, comfortable keyboard, and the fact that it could directly connect to compatible disk drives and printers without expensive expansion modules and interfaces. The Vic 20 had been affordably marketed for around $400 when it first came out and it quickly caught the imagination of many consumers and educators with several user-friendly and affordable peripherals (such as joysticks, a "datasette" cassette storage device, modems, printers, and shortly thereafter the VIC-1540 floppy drive, etc.) being released. During the early 1980's IBM was promoting the PC Jr. computer which was radically inferior (in most ways) to the rest of the home computer systems on the market and vastly more expensive. Commodore was, therefore, really receiving more competition from the Atari 400 and 800, the Texas Instruments 99, the Radio Shack Color Computer and the Apple 2 computer. Despite the rivalry between these 8-bit manufacturers much of the credit for innovation goes to Commodore and MOS Technology largely because Commodore consistently pushed the price down and because the Atari and Apple computers used the MOS Technology 6502 processor as their main microprocessing chip. In the very early 1980's unique marketing schemes were developed by different firms trying to cash-in on the developing computer craze. The fascination that many people had begun to experience with the fledgling computer video game, educational, business, and word processing capabilities of these computers quickly led to various multi-level marketing groups trying to involve people in selling these machines. There were few computer stores at the time and most of them were small. Computers were somewhat of an uncertain novelty item which many of the larger electronics and department stores were a little slow to embrace because of the uncertainty and lack of experience in dealing with such products. Consumers were often equally tentative and uncertain although there was a great deal of enthusiasm on the part of those who were keenly interested in such products. Many factors such as these created opportunities and schemes for the smaller and more venturous and creative individuals who wanted to get involved-- sometimes in unconventional ways. Oftentimes young and penniless entrepreneurs developed some hot selling Commodore software or hardware on a very low budget resulting in overnight fame and fortune. Just as the Commodore Vic 20 was beginning to become fairly popular and many stores and some multi-level marketing programs had acquired significant inventories of Vic products rumors began to emerge that Commodore was working on a vastly more powerful version of the Vic 20 to be called the Vic 64 and eventually called the Commodore 64 (many came to casually refer to it as the "C-64" or just the "64"). As the rumors of the impending release of the Commodore 64 continued they sparked excitement and uncertainty in the Commodore market. Those who had invested quite a bit of money into the Vic 20 line found themselves with ambivalent and mixed emotions. This was probably the first experience which many individuals had ever encountered with the phenomenon we now refer to "upgrading". Undoubtedly some became resentful. Some of those who had developed their marketing strategy and acquired large inventories of Vic 20 products found themselves scrambling around to modify their plans or to obtain price-protection as the value of Vic 20 products began to plummet rapidly. Commodore had originally planned to release the Commodore 64 for nearly $1000 (without any floppy drive or monitor) but by the time it actually hit the market they had already decided to reduce the suggested retail price to just under $500. This was still a lot of money back then-- keep in mind that $500 back then was about the equivalent of $1000 today. Still, it was the best deal on the home computer market-- especially since it had a built-in RF modulator for connecting directly to a regular television set. Amazingly, the price of the Commodore 64 plummeted to under $300 within a matter of months, and a few months later was down to $200. Suddenly customer interest in these amazing new computers began to heat up. About this time many sizeable chain stores (some of which had already been carrying Vic-20 merchandise) began to carry Commodore 64 items. Regional electronic superstores got involved as did a significant number of smaller computer dealerships. Eventually Commodore 64 and Vic-20 software and hardware was carried by such national department stores as Sears, Montgomery Ward, Fred Meyer, LaBelles, K-Mart, and many others. Also, many toy stores such as Lionel Play World and Toys'R'Us began to sell these computers. The price dropped by another $50 and dealers were buying the Commodore for just over $100. Commodore became so popular that Commodore even offered shares of stock on the stock market for several years. As the competition among retailers heated up it was not uncommon to see retailers willing to sell the Commodore 64 systems at cost or even at a slight loss in order to lure people into their stores. The strategy (which usually paid off) was that customers would see the computer selling at an incredibly low price of near $100 and come to buy the computer and end up buying the 1541 disk drive, a Commodore printer, Commodore modem, a 1702 Commodore monitor and a bunch of educational software, games, supplies and accessories to go along with it. By the time the customer walked out the door the purchase usually resulted in significant profit to the retailer. Many after-market and 3rd party manufacturers subsequently began to create and market Commodore-compatible software, hardware, books, and accessories in an effort to get in on the blossoming industry. Many Commodore magazines also became established-- some of which even included monthly disks with many free programs on them. Many of our present software and hardware giants got their humble start during this period. Microsoft's Multiplan became a very popular spreadsheet for Commodore. Other companies such as Electronic Arts, Accolade, Activision, Cinemaware, Cosmi, Batteries Included, Sublogic, Epyx, Access, Infocom, Mastertronic, etc. soon became household words. Commodore service and repair centers became quite common. Training centers taught computer fundamentals and programming using Commodore computers. Many schools, universities, research centers and educational enterprises began using Commodore computers. A significant number of small and medium size businesses used Commodore computers as well. Unique marketing approaches continued to develop as smaller companies and private individuals began developing the concept of shareware or freeware. This new concept was based on the idea that a programmer could write and copyright a useful or fun program and then freely distribute copies of it to the public on the condition that end users would pay a registration fee to become an official user of the program. Usually a relatively small fee was supposed to be sent directly to the program's author. Oftentimes the author would provide an updated or more complete version or accompanying manual or program add-on or other benefit as an incentive to pay the registration fee. This kept overhead, production, and marketing costs down by relying on grass roots distribution and the "honor system" of marketing. Several shareware and freeware programs became fairly famous during this time, but undoubtedly a great many programmers' dreams never quite lived up to expectations. The idea of try-before-you-buy software has continued to evolve up to this day-- becoming more and more sophisticated and creative. Also, during this same time period a great number of public domain programs began to emerge. There were many programmers who had written and not copyrighted their programs for various reasons whose programs began to be freely distributed without any registration fee being required. This greatly added to the availability of affordable software. Another interesting phenomenon-- Commodore User's Groups-- began to unfold during this time. This phenomena was a result of the need and desire of people to share information regarding their computers and interests. User's groups were popular among other brands of computers, but probably not to the extent that they were popular among Commodore users. 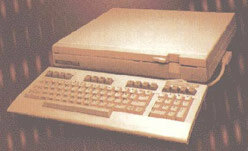 The Commodore was seen by many as the ideal hobby computer and many of those who had lower budgets had been attracted to the Commodore because of its price. Frequently these individuals (who often had more time than money) developed an incredible loyalty toward the Commodore computers. It was amazing that many of these Commodore users often showed more commitment to the Commodore 64 than Commodore Business Machines did. A large factor in the success of the Commodore 64 was its amazingly versatile, futuristic and user-friendly design. The fact that this amazing computer had more memory, a nicer keyboard, and was easier to interface with peripherals than most computers of that era made it so it was and still is (in many ways) an ideal computer for educators, hobbyists, game players, beginning programmers and musicians. For the money it was also hard to beat as an affordable home word processing system. Its only weakness was in the area of larger business applications because of its 40 column video display, limited disk storage and slow disk access. The powerful combination of Commodore chips allowed some amazing capabilities. The Commodore 64 utilized the 6510 microprocessor chip which was an advanced version of the MOS Technology 6502 microprocessor which had been used in the Vic 20, Apple 2, and Atari models. The 64 had revolutionary sound via the 6581 Sound Interface Device (SID) chip and was probably the first home computer to be able to emulate the human voice without additional hardware. This SID chip provided for 4 different voices and many sophisticated sound forms. The C-64 had superior 16 color graphics with sprite capabilities due to its 6567 Video Interface (VIC) Chip. The other support chips in the Commodore 64 were equally impressive for that time period. At the same time the early IBM home computers were non-color and non-graphic machines with sound that amounted to little more than beeping. The Commodore home computers were fairly reliable considering their low price tag and sophistication. Many individuals went for years with very little maintenance and repair work required. However, certain problems with the hardware did manifest themselves periodically and somewhat predictably. Many of the repairs required for these computers stemmed from static electricity discharges blowing out the 6526 CIA chip-- usually from touching the joystick or game port after picking up static electricity from walking across carpet or touching the front of the television or monitor. This would result in some keyboard or joystick control malfunctions. Power supplies would occasionally fail or develop deceptive heat-related problems sometimes blowing out ram chips in the process or causing strange looking colored blocks or characters to appear on the screen. The 906114 PLA (logic array) chip (sometimes labelled with the number 82S100N or PLS100N) would sometimes fail spontaneously causing the computer to no longer have a picture. The 6581 SID sound chip would sometimes go out-- usually due to a monitor being connected improperly. On rare occasions the 6510 microprocessor, the 6567 NTSC VIC (video chip), the 901227 Kernal ROM, the 901225 Character ROM, or the 901226 BASIC ROM would fail. The Commodore disk drives would periodically need alignment and cleaning and an occasional chip replacement or bridge rectifier or such. Keyboards would likewise need to be cleaned infrequently. Because of the interdependency of each of the internal components of the Commodore computers it is not unusual for Commodore computers to have similar symptoms while actually having different underlying problems. Even when experiencing occasional hardware problems the Commodore users rarely felt like they were at the mercy of the service wolves due to the many options which they had. Oftentimes there were simple and easy to implement solutions for Commodore malfunctions. Fuses (which were usually easy to replace) would get blown out in the computer, drive, or power supplies periodically, but they were all usually available at Radio Shack stores. New cables or external cleaning of contacts was sometimes all that was required. Some seemingly complex problems (especially with the Commodore 128 and Amiga) stemmed from the fact that various chips sometimes became loose in their sockets and could be easily pushed in tighter or removed and reseated. The good news was (and still is) that (even in a worst-case scenario) the Commodore computers and peripherals could usually be totally replaced with a new replacement unit for less than the average minimum repair fee for most IBM and Apple systems. As used Commodore computers became widely available at amazingly low prices during the late 1980's and throughout the 1990's many of the Commodore repair centers had difficulty staying in business. Despite this, there are still a few local and several national places who do Commodore repair work, sell parts and manuals, and have diagnostic software and hardware tools and information available. Commodore had to constantly work to develop peripherals to go along with the blossoming market during the 1980's. Because Commodore was marketed so widely in so many large national department stores and in so many foreign countries there began to be a big demand for these accessories and peripherals. During the mid to late 1980's individuals walking into most major department stores which sold computer products would typically have seen software and hardware for IBM, Apple, Commodore, and oftentimes Atari side-by-side or in close proximity. The Vic 1525 printer and a higher quality model 1526 had replaced the early Vic 1520 printer. The Vic 1540 disk drive was replaced by the model 1541 drive. Commodore also continued to work behind the scenes to develop new computer models. Commodore unveiled the Commodore SX-64 portable computer around 1984 which was incredibly nice and affordable for its time period. The SX-64 computer had a detachable keyboard and a 5" color monitor and a floppy drive built in. It needed to be plugged into an AC outlet, but for its time it was amazing. It is still considered to be one of the nicest collector's items available. The SX-64 did not become as popular as the Commodore 64 did, but the fact that it had almost total compatibility with the desktop Commodore systems made it quite popular-- especially to those who needed to travel and/or go to Commodore User Group meetings. Then in about 1985 Commodore released the beautiful Commodore 128 computer (utilizing the Commodore 8502 microprocessor) which had three different modes of operation and two different display options. 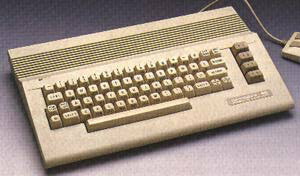 One of the reasons the 128 was quite successful was that it had the advantage of being able to use virtually all Commodore 64 software (while in the Commodore 64 40-column mode), peripherals, and accessories and yet also had a (rarely used) CPM mode and a fairly popular Commodore 128 mode which allowed an 80-column display, as well as the 128k of memory, BASIC 7.0, a numeric keypad, and a faster higher capacity disk drive-- the 1571 floppy drive. Therefore, the Commodore 128 overcame many of the weaknesses and drawbacks which the Commodore 64 had with regards to business applications. All of the Commodore disk drives at this time were 5 1/4" floppy drives. However, Commodore eventually also released a 3.5" disk drive-- the Model 1581 which had significantly higher storage capacity (800k). The Commodore 128 could use the monitors and disk drives designed for the Commodore 64 quite well. However, to take advantage of the increased disk speed and storage capabilities of the 128 the 1571 or 1581 disk drive was required. Also, to take advantage of the 80-column mode an RGB monitor was required. 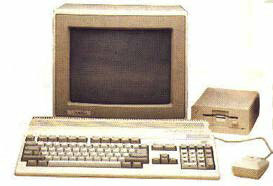 Therefore Commodore made several monitors which had both an RGB mode and a composite (audio/video or audio/chroma/luma) mode. Other manufacturers such as Philips (Magnavox), Thompson, Teknika, Amdek and a few others also made monitors which could support both the 40 and 80-column mode of the Commodore 128. Most of these same monitor manufacturers (and others such as Sakata and BMC) had also previously made models for the Commodore 64 and wanted to continue profiting from the Commodore consumers. In fact Philips (Magnavox) actually made many of the Commodore brand monitors for the 128. In fact, it was not uncommon for Commodore to subcontract with other manufacturers to produce peripherals with the Commodore name on them. Most of Commodore's printers, floppy drives, and monitors were actually made by other manufacturers to Commodore's specifications. Most of these Commodore branded printers and monitors were essentially identical to existing or subsequent models made and distributed with the OEM (original equipment manufacturers) brand name-- except that the Commodore version almost always had special Commodore features and/or interfacing. Commodore compatible floppy drives made by other manufacturers also emerged, but they were independently developed (for the most part) due to the fact that the Commodore 64 and 128 drives were "intelligent peripherals" possessing chips that Commodore had decided not to license or supply to its competitors. Hard drives were not common (or affordable) back then, so virtually all Commodore programs had to be run off of floppy disks, datasette cassette tapes, or cartridges. The Commodore drive was fairly slow in loading programs so many different utilities, cartridges, and hardware modifications became available on the market for speeding up disk access. By the mid and late 1980's a staggering selection of software was available for the Commodore 64 and 128. Literally thousands-- if not tens of thousands-- of different commercial titles had been marketed and an equal or greater quantity of public domain and shareware programs were available. Unfortunately, not many games or educational programs took advantage of the 128's advanced modes because software developers chose to write programs for the larger base of users who owned Commodore 64 machines-- knowing that their programs would automatically work in the 128's C-64 mode. There were, however, numerous business, word processing, and developmental programs and some telecommunications programs written to take advantage of the Commodore 128 mode. Many of these features and programs became useful as businesses, writers, programmers and modem and BBS (electronic bulletin board services) began to see the advantages of using the Commodore 128 for serious professional applications. We owe quite a debt of gratitude to many of these early developers and computer users who began to develop and utilize the fledgling computer software and telecommunications industry. Fortunately, Commodore and other manufacturers provided a good selection of software and telephone modems such as the model 1600, the 1650, the 1660, the 1670, and the 1680 modem. If it had not been for pioneering efforts of individuals like this we may not have had the great capabilities which we have now with computers and the Internet. Around 1986 or 1987 Commodore released the Commodore 64c computer which was essentially functionally identical to the original Commodore 64 except it was more sleekly designed and more attractive. Commodore also released the 1541c and the 1541-II floppy drives to go along with this nicer looking Commodore 64c. Many people's lives have been greatly blessed by the advent of the Commodore computers. Many handicapped individuals and shut-ins have had great opportunities open up to them from these computers. Many slow learners and children who may not have taken an interest in learning found that learning can be fun because of the Commodore computers. Many family gatherings, birthdays, Christmasses, parties, and other social events have been enriched by the creative fun involved. By being addicted to something as enjoyable and of such a positive nature as this many have been lured away from (or spent less time and money on) harmful addictions such as drugs and alcohol. Many lifelong and job-related skills such as typing, programming, and word processing were acquired via these computers. Many computer retailers, department stores, manufacturers, and programmers have profited financially from the Commodore computers. Many other businesses, researchers, students, and other ventures have also benefitted either directly or indirectly. Undoubtedly the social and technological spin-offs from these computers have had a ripple effect which has directly improved the lives and strengthened the economy of our entire nation and other nations. The ability of people to have wholesome and affordable recreation and a diversion from everyday stresses and pressures undoubtedly has helped the mental health and outlook of many individuals also. Many of those who have gone on to make huge contributions to the computer industry began with the Commodore home computers. Many Commodore C-64, 128, and Amiga computers are still used in schools, businesses, production studios, and as control devices. They are still some of the best computers to learn computer fundamentals on. The fact that these Commodore computers have so many built-in functions and capabilities still makes them fun computers to experiment with. Because you can still obtain many hundreds of the original programs for these computers they are still viable choices-- especially for hobbyists and home educators. The fact that the Commodore 64 can connect directly into a normal television makes it a good choice still for those on a budget. The fact that users of the Commodore computers did not need to constantly reconfigure, re-install, and uninstall software or worry about viruses and system crashes (as is common with our more modern Windows computers) allowed users to spend the majority of their time actually using the computer rather than spending so much time fighting it. During the mid to late 1980's a certain amount of software piracy began to hurt the Commodore software market. Much of this piracy was likely induced by unnecessarily high prices. Fortunately, most people realized that the programs were such a good value for the money that it wasn't too big of a problem. Several software manufacturers developed sophisticated software protection schemes to make it difficult for people to duplicate Commodore software. However, these schemes seemed primarily to hurt the honest users more than the dishonest people some of whom became extremely adept at defeating the protection schemes. Many software manufacturers finally decided to eliminate the software protection or to use off-disk protection schemes so that the legitimate users wouldn't be hurt and inconvenienced. Eventually many of the software manufacturers began to realize that the best way to discourage software piracy was to make their software more affordable. Undoubtedly, however, the dishonesty and greed of some individuals contributed somewhat to the gradual decline of the Commodore software industry. Some of these individuals never learned that it is not wise to kill the goose that lays the golden eggs. Some of these hackers probably felt that they were just having harmless fun and felt somewhat challenged by the prospect of trying to outsmart the copy protection schemes. As interest in the Commodore computers began to decline Commodore Business Machines and many other vendors of Commodore compatible products lowered their prices on both hardware and software in an attempt to maintain interest in their products. Commodore also began bundling software with hardware and making package deals as did other producers. Just when many individuals felt that the Commodore 64 may begin to lose ground to the newer IBM and Macintosh models of the mid 1980's a company named Berkeley Softworks created a new operating system for the Commodore 64 called GEOS which became immensely popular and helped to rejuvenate interest in the Commodore line. GEOS (which stands for Graphic Environment Operating System) was largely a takeoff of the popular early Macintosh (icon based) mouse oriented operating system. In fact, GEOS came with Geowrite and Geopaint-- much like Macwrite and MacPaint. Commodore owners were thrilled that they could have a computer which could perform nearly like the Macintosh-- for just a small percentage of the price of a Macintosh-- while still having color graphics and sound which surpassed the capabilities of the Macintosh. The fact that Berkeley was able to squeeze so much power out of the Commodore 64's limited memory and disk capacity was a tribute to the highly efficient programming which Berkeley implemented. Certainly Microsoft could take a few lessons about efficient programming from those who wrote GEOS. A full line of GEOS-based programs ensued. Around 1986 or 1987 the Commodore 128D was released and became quite popular. The 128D was basically a Commodore 128 computer with a built-in 1571 disk drive and a detachable keyboard. The idea was to conserve desktop space and make a nicer looking computer to compare with the professional appearance of the IBM compatibles. This computer had the latest chip revisions made for the Commodore 128 and 1571 drives and had more video memory. This was perhaps the best 8-bit computer made by any manufacturer. The fact that there were not so many cables and wires running around and that it did not hog as much desktop space (due to the fact that the monitor could sit on top of it) made it very nice to use. During the 1980's several large Commodore and Amiga trade shows and user conventions were held throughout the United States and in some foreign countries-- especially Canada. Commodore also usually had large displays at COMDEX and other consumer electronics shows. Thousands of users, retailers, and developers usually converged on these gatherings. This was quite a spectacle to see. The exciting and innovative new products which were unveiled at these shows kept Commodore users, dealers, and distributors coming back for more. The fact that there was fierce free enterprise competition-- and the fact that the computer industry had not yet conceded (or capitulated) to the dominance of Microsoft and IBM-- led to unprecedented creativity. Unfortunately, however, many people began starting to demand uniformity and standardization at the expense of innovation. Commodore had been so competitive in the marketplace that IBM, Apple, and Atari had been forced to lower their prices and improve their features and quality. These other manufacturers were successful in doing so-- to the point where many people started being attracted away from Commodore toward other brands. However, if it had not been for Commodore being such a huge factor in putting downward price pressure and creating such innovative home consumer products the evolution of affordable quality home computers would have occurred much more slowly. A large number of Commodore gaming enthusiasts were also drawn away in the mid to late 80's as Nintendo and Sega began to market their 8-bit game systems which were somewhat simpler and easier to use (but in many ways less versatile) gaming systems. The Commodore computers had permeated the U.S. and foreign markets very substantially by 1985. By the late 1980's somewhere near 10 million Commodore 64 compatible machines had been produced and distributed when sales began to rapidly decline. Probably 70 or 80 percent of the Commodore 64 compatible machines manufactured were Commodore 64s and 64c models and only about 20 or 30 percent were 128 models. Less than 5 percent of them were the SX-64 machines. It is probably safe to say that the Commodore 64 was the best selling computer model ever made by a single manufacturer-- if judged by number of units sold. Commodore's demise was largely a result of poor marketing and external market forces-- not lack of development. Of course, not all of Commodore's products were big hits. Commodore made several products which were fantastic ideas (in their own right) but never actually caught on because of poor timing or other unpredictable factors. One of these was the Commodore Plus 4 computer. The Commodore Plus 4 had been developed on the heels of Commodore's great initial success with the Commodore 64. The Plus 4 was very nice because it was smaller and had built-in software applications. Despite being a very beautiful little computer with many excellent features it never really became popular probably because it wasn't very compatible with the large base of software which had already been developed for the Commodore 64. Many (but not all) software manufacturers seemed hesitant to want to invest development efforts for this computer when there were so many who already owned Commodore 64 computers who were clamoring for software. Among other Commodore 8-bit products which never caught on well were the Commodore 16, the B-128, the SFD1001 disk drive, and several others. Perhaps the biggest heartbreak of all of Commodore's efforts centered around the 16-bit Amiga computer which had initially been developed by a separate company. Commodore acquired or bought out the Amiga technology from its original developers and began developing and marketing Amiga computers during the mid 1980's. The Amiga computers were based on the Motorola 68000 processor and were somewhat akin to the Macintosh. The extreme power, user-friendliness, multi-tasking abilities, incredible graphics and (stereo) sound, along with built-in speech synthesis were way ahead of the competition. Many Commodore 64 and 128 owners immediately realized the potential of the Amiga and decided to acquire one. It appeared to many-- for a while-- that Commodore may actually retain a dominant position in the market place with the Amiga being such an obviously superior computer to any of the home computers of the time. Unfortunately, the lack of a diverse software base came back to haunt the Amiga as people chose to stay with inferior hardware and operating systems in order to stay compatible with the large number of IBM and Macintosh systems and software products which had taken over the business world despite still not being particularly well suited for home use. Much of the downfall of Commodore stemmed from poor marketing, lack of dominance in the business sector, competition from other gaming systems, poor support, poor management, and growing competition. Commodore tried to expand into the IBM compatible market in the late 1980's with the PC compatible PC-10, PC-20, Colt, and even a 286 notebook computer and a few other machines which had only meager success. Commodore even developed an incredible interactive stand-alone CD unit (based on the Amiga technology) called the CDTV which (along with Philips CDI) were the predecessors to many of the CD-based interactive game systems which followed. In the final year or so before Commodore Business Machines ceased operations they had even developed the first 32 bit game system called the CD-32 which may have been a big hit if Commodore had endured a little longer. Amazingly, even after Commodore's decline started in the late 1980's the loyal Commodore and Amiga hobbyists and devoted users refused to give it up. A strong undercurrent of support arose. Even though most of the larger chain stores and distributors were forced to give up on Commodore products a strong effort to recirculate and refurbish old Commodore products has continued-- even to this day. In fact, in some countries, especially in Europe and Scandinavia the Commodore 64, 128, and Amiga computers are still immensely popular. Because such a massive quantity of items had been developed and produced for these machines a great many liquidations and surplus inventories of Commodore-related products remained available for many months from many distributors. Those who chose to keep supporting the Commodore machines were frequently able to pick up brand new merchandise at tremendous prices and pass the savings on to their customers. Much of this surplus new merchandise is still available today through the surviving resellers. It is not uncommon for past owners of Commodore C-64 or 128 computers to begin to feel a nostalgic attraction toward using the Commodore 64 again. Many of these individuals fondly reminisce about the intense fun they had in past years when computers were simpler and in many ways more fun. Back then the programs had to rely on content, strategy, and plot because many of the flashy special effects of the newer systems were not available. These older computers often left some things to the user's imagination-- by creating mental images-- instead of drowning the user in multimedia sensory stimulus overload as is often common with newer computers. 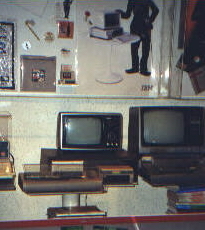 The Commodore computers and some of the Commodore-compatible software and accessories have become collectors' items for many individuals. Unlike most computers which seem to become outdated quickly, the Commodore computers seem to have a sense of timelessness about them. There is no doubt that the newer multimedia computers have some major advantages over the old 8-bit Commodore computers, but a little diversity can be a good thing. Just like watching an old movie, using some older computer programs can help one appreciate different things and gain different perspectives. Many classic old computer games and educational programs were never made on any platform other than Commodore and Amiga. In the midst of the craze and pressure to constantly upgrade and fight compatibility problems and system crashes with many of the newer Pentium systems it can be somewhat refreshing to step back for a while to a more relaxing time. Many home schoolers find the Commodore 64 to still be the best solution for younger children to learn with. For the price and simplicity it is still hard to beat. The simple programmability, availability of software, and ability to be integrated with existing televisions and curriculum make it a viable alternative for hands-on instructors and those on a budget. The fact that the Commodore 64 is viewed as being a "fun" computer often lures even the most resistive students into participation. Very few people are intimidated by the Commodore 64 because it (quite deceptively) almost seems like a toy. By making learning fun the Commodore 64 has already won half of the educational battle the moment it is turned on. Despite the fact that Commodore programs won't normally run on other computers there are some fairly recent emulators which have been developed which allow many of the older Commodore programs to run on some of the newer computers. However, many people still want to use original Commodore machines and software to have the full feel and compatibility of the original experience. Interest in the Commodore computers has resulted in a longevity of product availability which has exceeded even the greatest expectations. There is still some development of products and software for Commodore 8-bit systems. Creative Micro Designs is still manufacturing newer CPU chips and accessories for the original Commodore systems. They even still publish a magazine called Commodore World. There are also a couple of Commodore on-disk magazines being produced such as LoadStar and Commodore Gazette. There is even a company which recently announced the production of a new device called Web.it which is an IBM Windows type system which can automatically emulate and run Commodore 64 programs and even access the Internet. Gateway 2000 has acquired the rights to the Amiga and is currently developing new Amiga compatible hardware and operating systems. Several national dealers still sell and support Commodore and Amiga hardware and software through the mail and via the Internet. The internet has greatly helped maintain availability, support, and interest in old computers such as the Commodore by creating forums and awareness of available suppliers, users groups and other resources. The Internet is ideal for individuals who share a common interest such as this. Even though the Commodore 64 is not the ideal computer for surfing the Internet it can be done. However, most of those looking for Commodore support and affiliation on the Internet are probably using newer computers or devices such as WebTV to make surfing the Internet a little easier. A very sizeable percentage of individuals who are accessing the Internet with a newer computer undoubtedly still own older computers which they acquired in previous years who lost interest in them only because support for their old computer became difficult to acquire. A large number of these old computers have the Commodore or Amiga name on them. Now that software, hardware, accessories and support is so easy to locate and obtain a noticeable resurgence of interest is occurring. The main staying power of the Commodore and Amiga computers, however, is that they have become a part of the lifestyles of so many individuals. Many Commodore and Amiga user groups still meet regularly and publish monthly newsletters. People still enjoy their old games, educational programs, applications, and the creativity which these machines were so well suited for. If anything can now be said about the Commodore and Amiga computer systems it is this: "Rumors of the deaths of the Commodore and Amiga computers have been greatly exaggerated." Good things-- especially hobbies-- have long lives. Especially in the hearts of those who still love them.